The two-wing Bali Hai Service Center complex – with offices and a conference center on the left and ticket office, storage room, more offices and public restrooms on the right – sits empty, still in new condition. Critics of Pattaya’s lavish 2017 spending on the redevelopment of Bali Hai Pier predicted an office building and conference center the navy insisted it needed would become a white elephant. 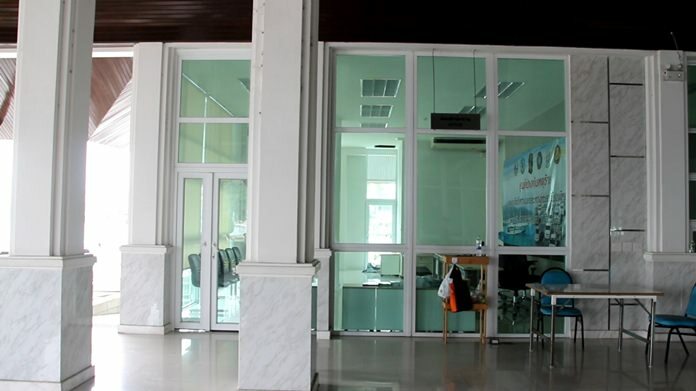 More than 25 million baht was spent on the Bali Hai Service Center, a facility the military government said was needed to impress foreign dignitaries. It was finished on time for the November 2017 show – and was never used. It still hasn’t been. Today, the two-wing complex – with offices and a conference center on the left and ticket office, storage room, more offices and public restrooms on the right – sits empty, still in new condition. The building was part of nearly 200 million baht in projects that Pattaya and the military spent on the pier, including 97 million baht on landscaping. At an early public hearing, the need for the building was questioned, with critics saying the pier already had adequate office space to manage boat traffic and pier administration. Another 30 million baht was spent to repair the dilapidated wharves, install 96 more CCTV cameras and add three speedboat docks. Pattaya engineering chief Nattapong Santaveesuk admitted the building has never been used, but denied it has been abandoned and forgotten. The city is still paying to maintain it, he said. Whether it ever actually opens is up to the politicians, he said.